From its distant view of the Eiffel Tower to a waterfront reminiscent of the banks of the Seine, the France Pavilion at Epcot has long possessed a certain je ne sais quoi, inviting guests to linger in a setting inspired by the sidewalks of Paris. And soon, that invitation will be extended in a gastronomic experience as French as Renoir and Monet: the crêpe. Scheduled to be built in an all-new location near the previously announced Remy’s Ratatouille Adventure attraction, the new crêperie will feature the cuisine of celebrity chef Jérôme Bocuse, the mastermind behind the pavilion’s Chefs de France brasserie and its celebration of gourmet cuisine, Monsieur Paul. With a menu inspired by the Brittany region of France, the new location will offer table service dining as well as a quick-service stop for guests craving savory crepes called galettes and sweet crepes. 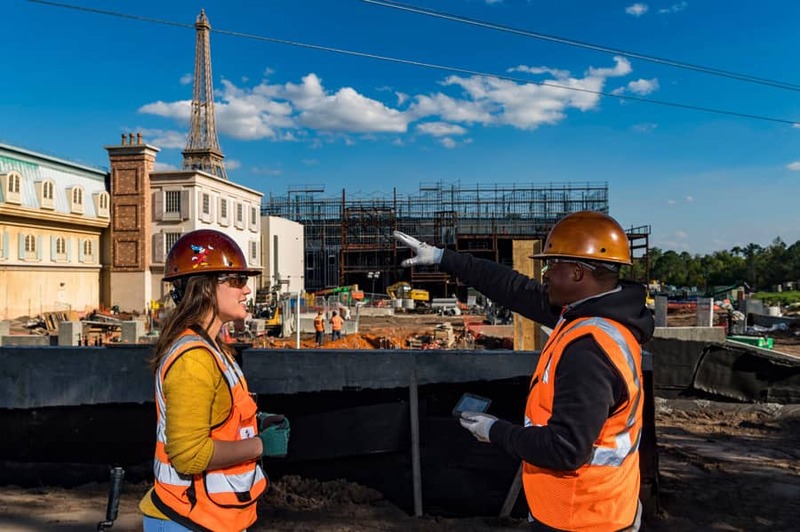 Imagineers overseeing construction near the entrance of Remy’s Ratatouille Adventure in the expanded France pavilion. 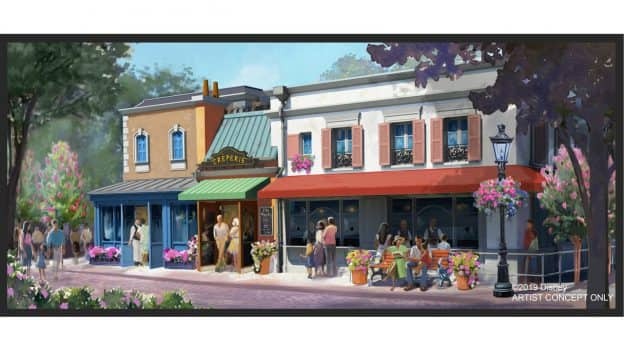 The restaurant is part of the multi-year transformation of Epcot and an enrichment of the France pavilion that includes—in addition to the classic “Impressions de France”—a “Beauty and the Beast” Sing-Along experience and Remy’s Ratatouille Adventure attraction, in which guests will virtually shrink to the size of French cuisine’s most famous rat and scurry to safety across the kitchen of Gusteau’s legendary Parisian restaurant. All are coming to the pavilion in time for the 50th anniversary of Walt Disney World Resort. Elsewhere in the park, new and enhanced films are underway, and construction continues on the new “Guardians of the Galaxy”-themed attraction and a first-of-its-kind area devoted to playful fun that’ll come to life under the dome of the pavilion previously known as Wonders of Life. In the meantime, don’t miss your chance to witness “IllumiNations: Reflections of Earth,” planned to run through end of summer 2019, and the seasonal splendor of the Epcot International Flower & Garden Festival. 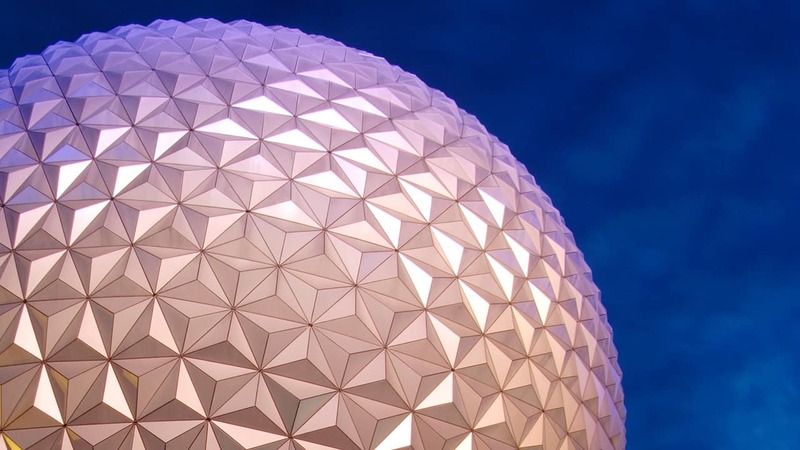 There has never been a better time to visit Epcot. I took my parents to Epcot many years ago and between the movie and sampling, well, almost all of the French pastries, it was a great vacation. A Crepe made with Nutella ! Tres Bon! Is the location in the new Ratatouille plaza behind the France pavilion (perhaps under or past the overhead gondola)? OR, is the location along the World Showcase path between France and Morocco?